A wood hand railing that is built next to a stairway or across a room for safety or as a room divider can really be turned into a piece of art with a few changes. Just by changing out the balusters to a different style of baluster can give a dramatic change to the appearance of your hand railing. Balusters come in many different varieties and are an integral part of the over all appearance. A couple varieties of the all wood versions of balusters are the all square version which resembles a 2x2 and the turned version which is round and comes with different profiles. 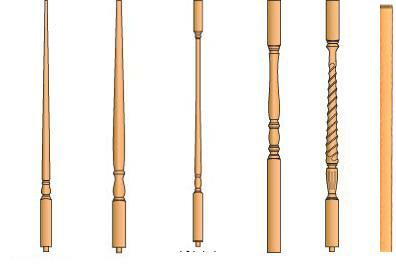 The turned baluster simply means that the profile on the baluster was created by being turned or spun on a lath. 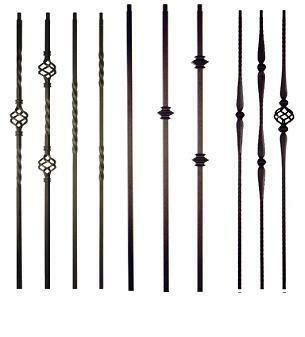 Here are a few of the many different profiles of the all wood versions of balusters. A unique and different way to go is to change out the wood balusters to iron balusters. Again here are many different profiles and varieties. A lot of times with iron balusters a couple different profiles will be used on the same railing. The different balusters are then staggered evenly the distance of the length. 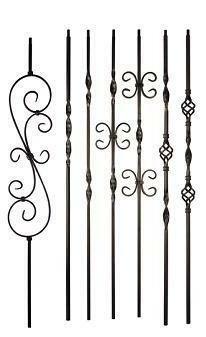 Here are some examples of the many varieties of iron balusters. Another way worth mentioning to fill the area of where the balusters are is to fill the space with glass. One glass panel which is factory cut for the exact measurement. I have built a few of these but only in the case where there is a bottom rail or shoe rail where the glass panel sits into and rests on. It then is cut to fit up into the top rail where the rail is plowed out for fillet. The fillet is then ripped down and is snuged in on each side of the panel at both the top and bottom rails the total length and holds the glass snugly in place. Only quality glass should be used for this that is purchased and cut by a glass company, obviously for safety reasons. If you should decide to go the glass panel route the glass will need to be cut very precisely and there is very little room for error. The glass needs to fit up inside the top rail and then swing into the bottom or shoe rail and then drop down into the shoe rail while still catching the top rail and not falling out. One way to get the precise size that the glass would need to be cut at is to make a precise pattern out of card board. Then take this card board to the glass company and have the panel cut. Again be very careful to have the exact size needed as this type of glass is some what expensive and a small mistake could be costly. On the type or style of railings where fillet material is not used going the glass panel route would be a considerable amount of work. This type of railing would have to be further disassembled so groves could be cut for the glass panel to fit into. That is not to say it can't be done though. Almost anything can be accomplished with a little ingenuity and creativity. There are a few other ways to enhance a railing and will be discussed in future pages on this site. How to install a wood handrail. Return From This Hand Railing page to Home - Finishcarpentryhelp.com.